So it's been a week since I fell and hurt my wrist. I haven't been sleeping AT ALL. If I do get to sleep I'll wake up and have pain all the way up my arm into my shoulder. It's that bad. I finally have in and rolled out of bed to head to the ER. I have never been to this hospital before, the one right by my house was HORRIBLE last time I was there so I am never going back again. I walked in, was taken right back, and other than a few ambulances coming in with mostly heart attack patients, and two kids with broken arms, there was nobody else there. 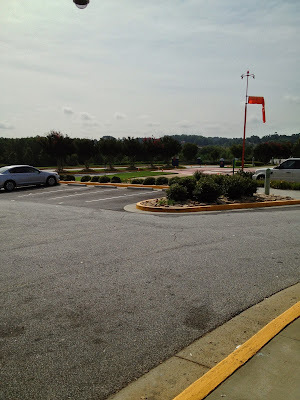 After my hospital adventure, I went to Kroger to get my prescription filled. 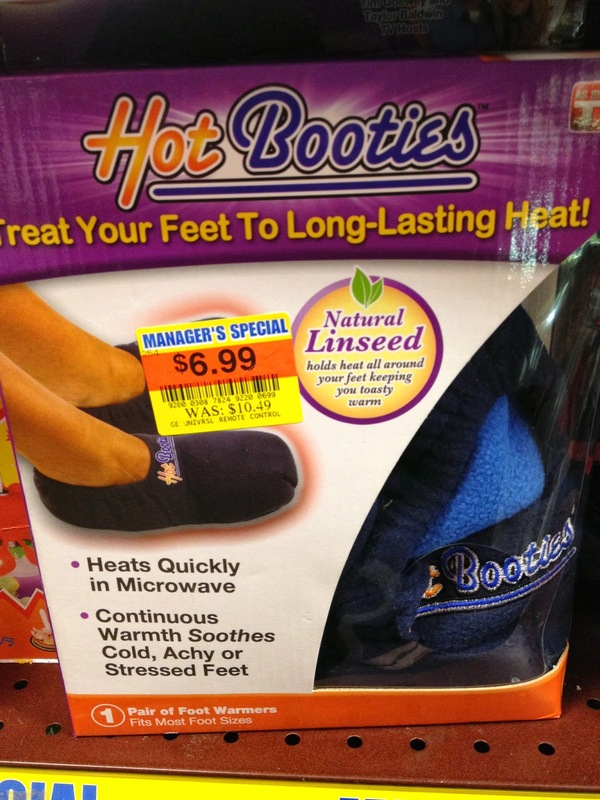 While I was waiting, I came across Hot Booties... I did not buy them, but I was sure tempted, lol. In other news, today is my 10 year anniversary with Best Buy. 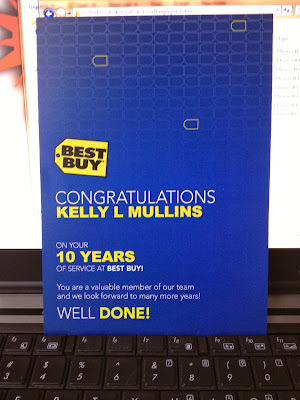 It is so hard for me to believe that I've been working for 10 years, let alone for one company. 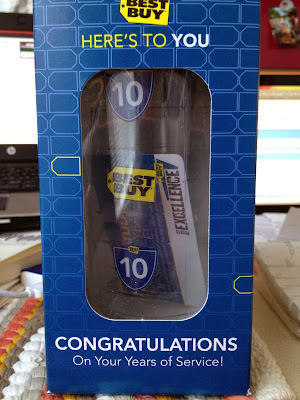 I got a tumbler... and Path to Excellence points (they can be used to buy stuff) the stores have been on PTE for a while, but since I came from Logistics where PTE doesn't exist yet, my anniversary points are my very first. I also got a little card. My 5 year certificate was way cooler, but it's still all good. Right before bed, Cokaya did something cute. I had pulled out the sock drawer to do something a couple of days ago and just hadn't wrestled it back in place. I am fairly certain I have similar pictures of at least two of the cats I had growing up too.